Natural beauty, spectacular gardens… one of Tuscany’s most enchanting estates, tucked away in the lush green hills, La Foce; its fascinating history has inspired the music festival “Incontri in Terra di Siena”, which celebrates its 25th anniversary. For the recent opening a few late piano pieces by Rossini… their beauty enhanced by Marco Marzocchi’s elegant touch. Antonio and Iris Origo’s daughter Benedetta created the annual music festival in their memory in 1989. Iris was an Anglo-American writer who had many creative friends, one of them was one of the greatest violinists, Yehudi Menuhin. Benedetta Origo said: “My mother and Yehudi were sitting next to each other at a dinner in Rome, and he had read her book ‘War in Val d’Orcia’ and wanted to know from my mother what had happened to our nanny, Schwester Marie. It’s actually through her and Yehudi that I met my husband Alberto. He was Menuhin’s only pupil… and they came together here… and that’s how we met and fell in love”. The offspring of that marriage was Antonio Lysy, Grammy award-winning, renowned cellist, and artistic director of the Festival. “Each time my son Antonio came here on holiday he would bring his cello and play in the courtyard of the nearby Castelluccio, and he used to say: ‘What fantastic acoustics, this is ideal for giving concerts!’. When he was about twenty he decided to invite his school friends and colleagues to holiday here… And what was holiday for them? Music, always! That’s the most beautiful thing for a musician – to make music,” said Benedetta Origo. The Festival is surrounded by history and art but La Foce was once a poverty-ridden valley. Iris and her husband bought the grounds in the early twenties and worked hard to improve the landscape and bring change to the population. “Land had to be reclaimed, dams, basins, roads – everything had to be built! That was my grandfather Antonio’s job”, said Katia Lysy, Iris Origo’s granddaughter. “My grandmother Iris built a small clinic, a school… During the war she also set up a place for refugee children – it’s these kids behind me, they all look happy and well-fed!”, she added. Iris Origo died in 1988. She authored several books, among them her celebrated war diaries. Upcoming composer and conductor Francesco Cilluffo wrote a song cycle to pay homage to her work and personality. “Iris Origo managed to identify the essence of the Italian people. At the end of her war journal she says: ‘I see only desolation around me but I know that pulling up their sleeves and working hard to reconstruct everything from scratch is in-built in these people’. Her book, and my piece, end with these words: ‘Death and havoc visited us, but there’s hope in the air’,” he said. Hope, beauty, and an enchanting festival that continues to breath life into La Foce. “This valley is alive again!” said Katia Lysy. “There was a very creative, cultural atmosphere at the time in the garden… I hope today as well!” added Benedetta Origo. “Gran Tango for cello, piano and strings, by Astor Piazzolla and José Bragato – Antonio Lysy at the cello. 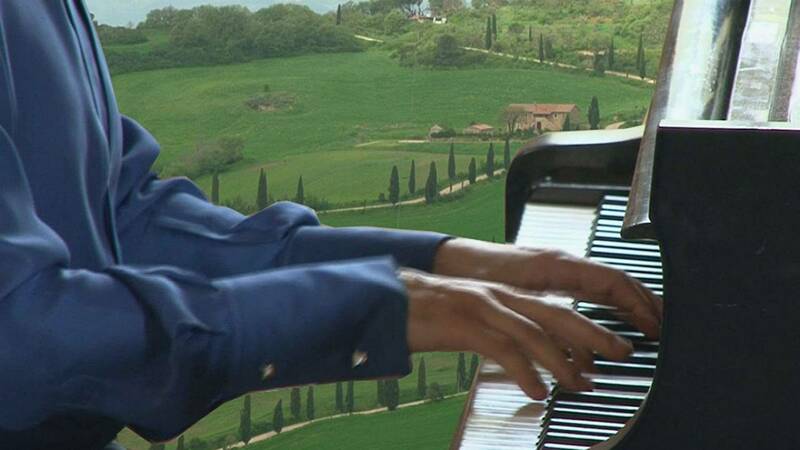 Music festival “Incontri in Terra di Siena” will take place from 19th – 28th July in Southern Tuscany.